This entry was posted on November 30, 2012 by Jessica Anderson. At Trophies2Go, each and every day we help companies recognize their employees. We create meaningful awards for top performers, sales stars, employees of the month, retirees, years of service, managers – you name it, we make it. But what do we do for our own employees? Our newest informal recognition program - Awesome Ribbons. 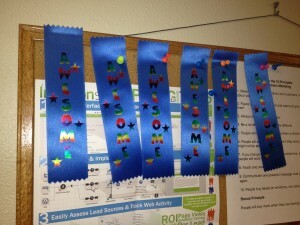 This fall, we created a new informal recognition program called “Awesome Ribbons”. The original goal of the program was to increase internal team-building. 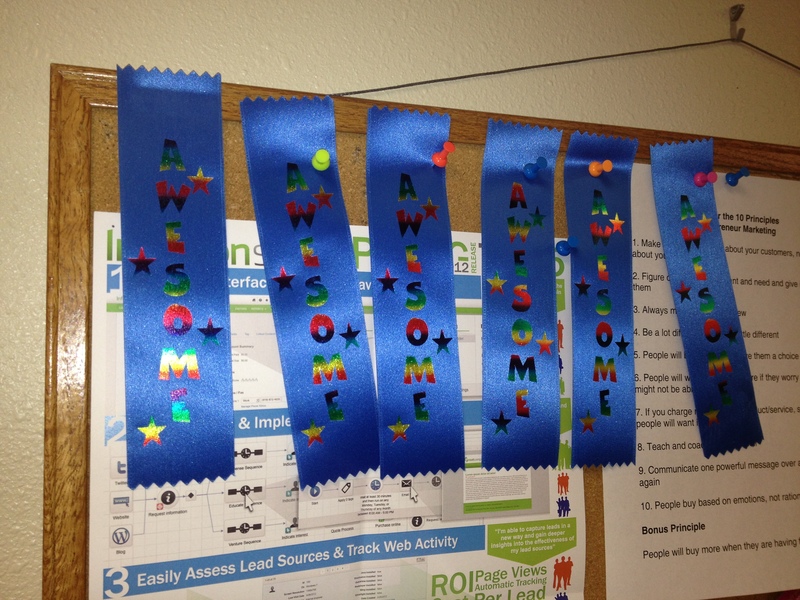 If a person noticed a co-worker doing something they deemed ‘awesome’, they awarded them a ribbon. These blue ribbons had the word 'AWESOME' on it in rainbow colors. Each person had 10 ‘Awesome’ ribbons to give away in a month and a half. DO: Give them to your co-worker when you notice him/her do something exceptional, either for you, another co-worker, a customer, or the overall company. Write the date, your name, the recipient’s name, and the task that earned the ribbon on the back (stickers were provided to write this info). Give them out before November 15, 2012. Display the ribbons you earn at your desk or work space. Keep the ribbons you earn – you will need them in the future. Have fun awarding your co-workers & receiving recognition! DON’T: Give them away for no reason. These are for awesome and exceptional things only! Give them for a petty reason, like looking nice or having a good day. “Re-gift” a ribbon. They only get awarded once. Bribe others to get them. They must be earned. Ribbons started circulating throughout the company within the office, at our production facility, and between the two sites. Ribbons also started showing up at work stations – pinned to bulletin boards, taped to computers, shelves and printers. It was fun to see everyone getting recognized for going above and beyond for the company, our customers and each other. After some time, the Nov 15th deadline arrived and the program was ended. Now came the important part of any recognition program - evaluating how effective the program was and if the goal of the program was attained. When we started the program, we weren’t exactly sure how the Awesome Ribbons would be used. Overall feedback about the program was positive. Our staff enjoyed giving and receiving recognition with each other. However, this seemed most worthwhile if it wasn’t tied to a competition. There was some confusion about what tasks were worthy of a ribbon. This wasn’t well defined. The majority of our staff wanted to continue the program. When creating a recognition program, things may not always go as planned; what you intend to happen doesn't always occur. This was the case for our program. We were glad that people liked giving and receiving recognition, but didn't expect that people wouldn't want to be competitive with their ribbons. When evaluating a recognition program, it's important to figure out what you did well and where you can improve for the future. That 's the best way to improve your program and reach your goal. When evaluating our 'Awesome Ribbons' program, what we did well was communicate the program, have a defined test period, and evaluate our staffs' experiences when it was completed. What we didn't do well was set criteria for giving a ribbon and set the expectation that this program was a competition. Our President, Jeff, has decided to keep the program going for now. The original goal of team building was met, along with more recognition within our company, which is always a good thing! For more information about creating a Recognition Program for your organization, please contact us – we’d be happy to help you.